Find out what's in the latest issue of HELLO! Fashion Monthly! | HELLO! August is supposed to be the height of summer and often the only chance to bag a tan – usually abroad. But here at HFM we’re already thinking about layering up again, especially given the new season’s lust-worthy offerings. For our fashion shoot, we’ve gone prim and prettily proper with high collars, elegant lines and demure coats. Think Brideshead Revisited crossed with Keira Knightley in Atonement. We’ve also picked out the best outfit-enhancing accents, from bows and ruffles to folds and pleats – not to mention those fabulous statement sleeves that caused such a flurry of excitement on the AW16 catwalks. 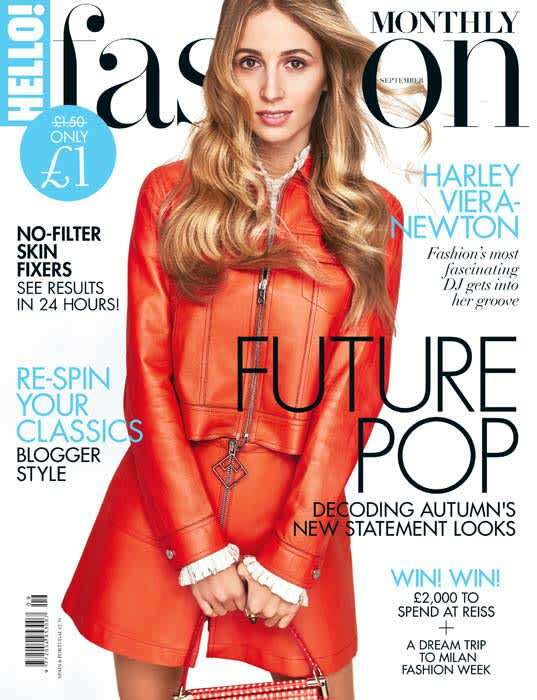 I was fascinated by our cover star, DJ-turned-designer Harley Viera-Newton. Part of the formidable Dellal dynasty, she boasts Brazilian and British heritage, and was raised in the US. Harley, 28, is clearly a grafter, having joined a band at 15 before moving on to DJing. Recently, she released her own high-end fashion line, HVN, and I get the feeling she may just be getting started. Another high achiever is ‘Deliciously’ Ella Woodward, whose personal journey to overcome illness has seen her become a pre-eminent food blogger. Our features editor, Delphine, visited Ella at home to hear her remarkable story. Thanks to all those who entered our #myHFM Instagram competition – this month we’re giving away an Accessorize charm bracelet. Happy snapping! Read the full interview in the March issue of HELLO! Fashion Monthly, out now. If you are having trouble finding HELLO! Fashion Monthly click here, enter your postcode and a list of stockists near you will appear. If you still cannot find a copy please give us a call on 02076678700. Click here to download HFM on Android and here to download it on iTunes.